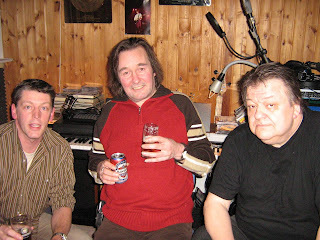 On 24 february 2007, I was invited to Johan Slager's house. It was good to see Johan and his family again, and as a 'bonus', Max Werner came along as well! We had a beer and a chat, and as always it was early hours before we knew it! A big thanks to the Slager family for their hospitality! 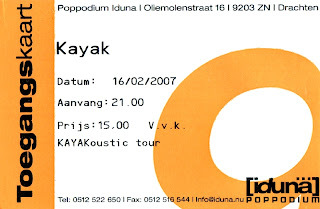 On 16 february, 2007, Kayak played their final Kayakoustic show in Drachten. Apart from seeing another great concert, I had the honour of being invited to the afterparty (along with some more die-hard fans). It was good to share a beer with these great guys and girls! Also nice: meeting my old Swiss mate Max (who had travelled almost 1000 kilometers to see this concert) and my English pals Judith and David. 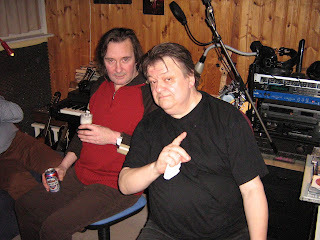 And it was also nice to see ex-Kayak-bassplayer Bert Veldkamp and 'Scaliger' Syb van der Ploeg in the audience. Max Demont arrived in time to witness the soundcheck. So instead of the usual concert photos, here are some pictures from the soundcheck... Merci, Max! 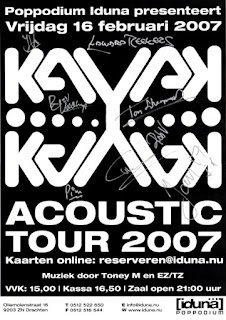 I'd like to thank Kayak for a fantastic Kayakoustic tour, the chats, the autographs, and for being so kind to the fans! Luckily, there are plenty of new plans for 2007/2008. See you all soon!! !